N.V. VSH FOODS, under the direction of Marlon Telting, has a solid team of sixty employees with a great passion for what they do. A team that works closely together, that continuously expands its knowledge and experience and actively applies these on the market. 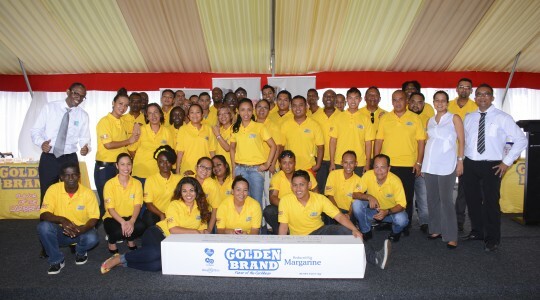 Through constant investments, we are convinced that we will continue to take the right steps towards improving our market position in Surinam and on the CARICOM market, developing new products that meet the changing needs of the consumer. Consists of a Management Assistant and Human Resources. Supports the General Manager and the Management Team. Responsible for gathering and analyzing human resource statistics and all other information related to our personnel. Takes care of the administrative management of all financial information. Design of advertisement materials and campaigns and the organization of events. Responsible for the purchasing of raw materials and excipients, packaging materials and office supplies, both locally and internationally. Responsible for storage, handling and issuing of raw materials and excipients, packaging materials and semi-finished products. Responsible for the production of products for the local and international markets. Co-responsible for the design and introduction of new products. Keeping all machines in A+ condition. Maintenance of the buildings and grounds. Inspection of the emulsions and finished products on the basis of the established specifications for fat, moisture and salt content and other additional micro and chemical analyzes of the products. Doing research and development into new products, in close collaboration with the Production, Sales and Marketing departments. Implementation, maintenance, development and monitoring of comprehensive and active safety, environmental and health policies. Optimization of and ensuring compliance with the quality management system.